My friend crochets these sweet little flowers which I have been collecting. 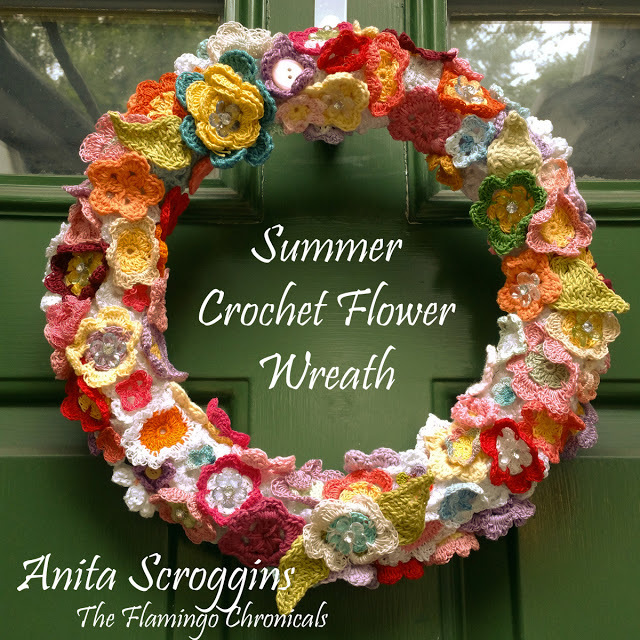 Usually I use them sparingly, one at a time on various project – but I thought my whole collection might look great together as part of a pretty DIY summer door wreath. Visit my blog for more details. What’s black and white and sunny all over? 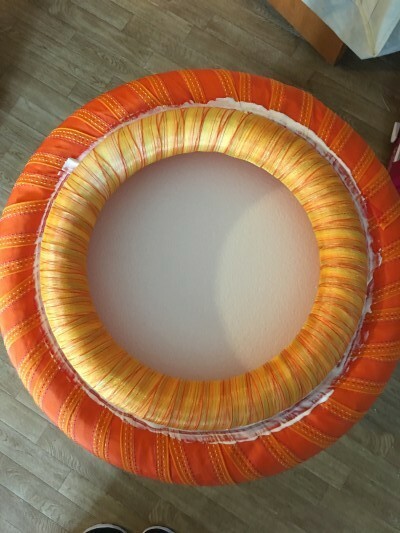 A felt-wrapped wreath with a bright sunflower accent! 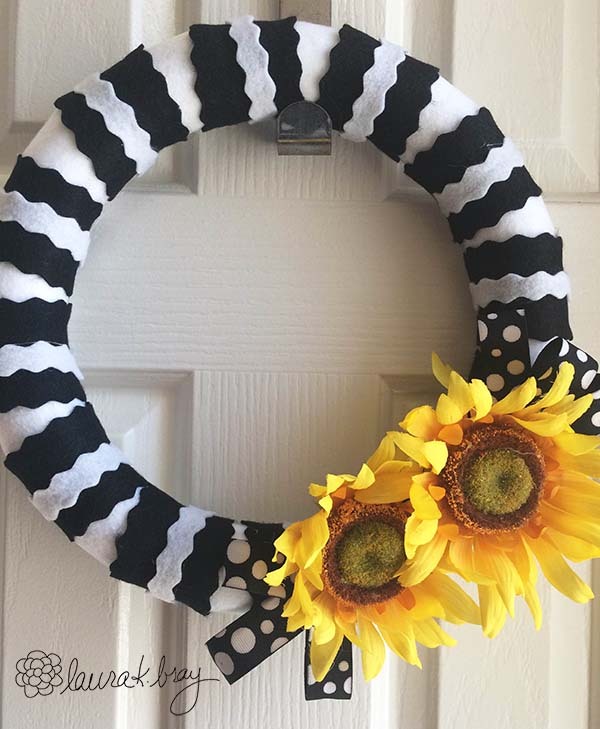 This wreath was inspired by my very happy childhood memories of big sunflowers in our backyard. Visit my blog to see how I made it! Hello! 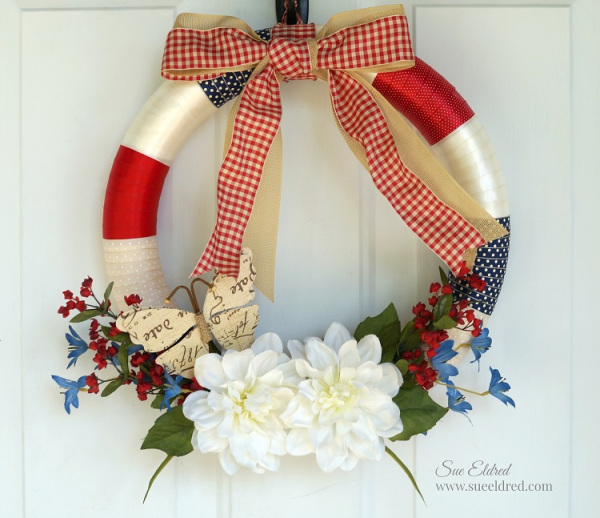 Today I’m sharing a fun and bright DIY flower wreath. 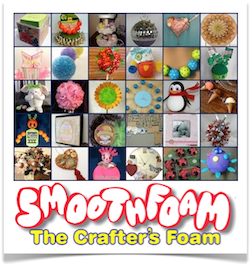 Smoothfoam now has wondertul wreath forms that have measurement marks to make our crafty lives easier! Wrap the larger wreath with darker ribbon and secure the ends with glue and/or pins. Wrap the smaller wreath with a lighter ribbon. Glue the two wreaths together and set aside to dry. Attach the flowers in between the wreaths with pins. 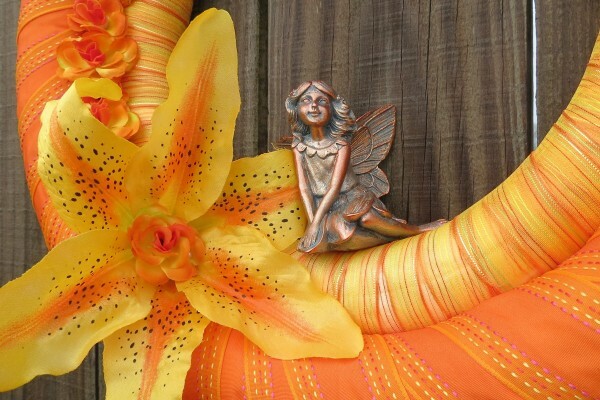 The final touch was this little garden fairy in the center, attached with some hot glue. Hope you all enjoy the coming warm weather and beautiful flowers! 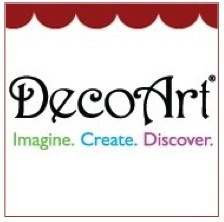 For more of my work, visit my blog and Facebook page! 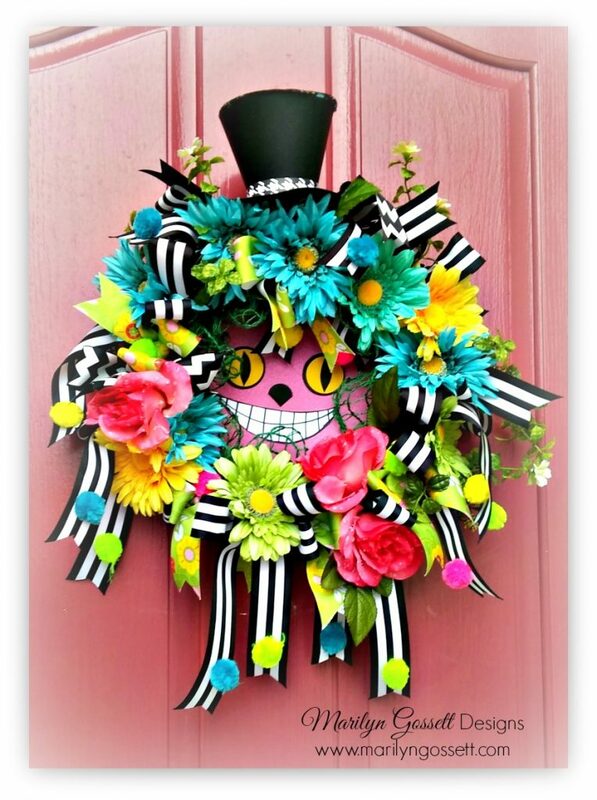 Spring is in the air here in North Texas and I wanted to a fun new spring flower door wreath to celebrate it. Even if the weather is not quite spring-like where you are, adding some fun floral décor will at least make it seem like spring inside the house! 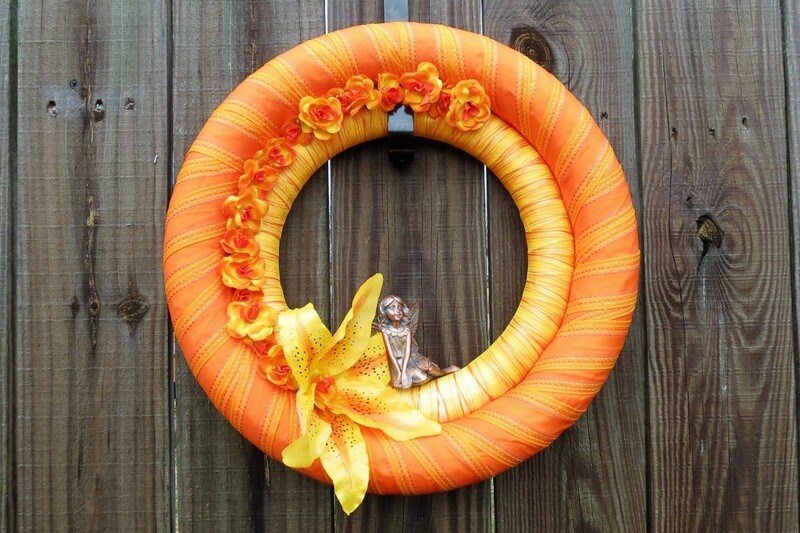 The Smoothfoam 12″ wreath is the perfect size for hanging on a china hutch or an interior door. 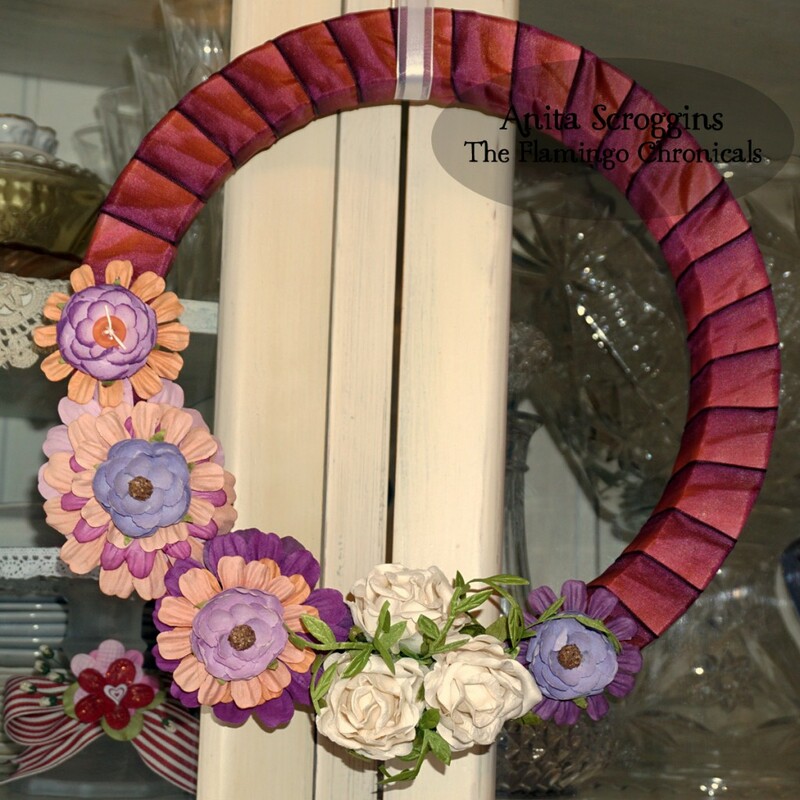 This fake flower wreath would also be wonderful for outdoor use if you used fabric flowers instead of the paper flowers shown here. I started by wrapping the wreath with my ribbon, slightly overlapping it as I went around. 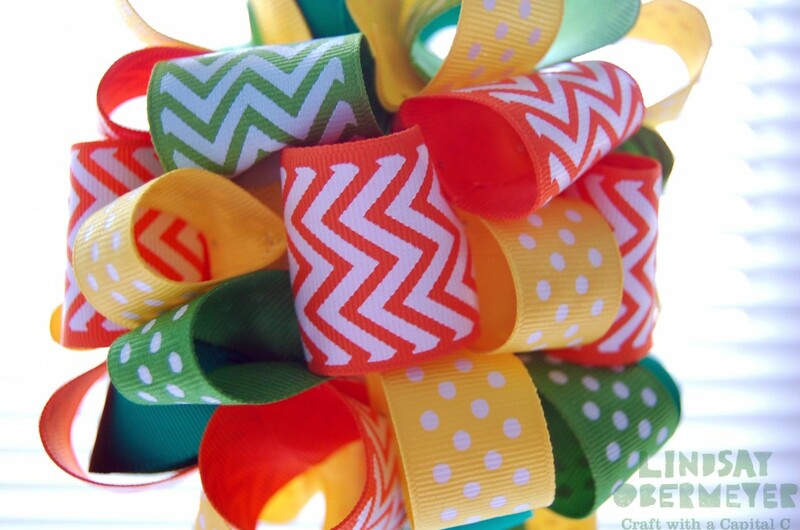 Finish the ribbon wrap by folding the edge under at the back of the wreath and pinning in place. 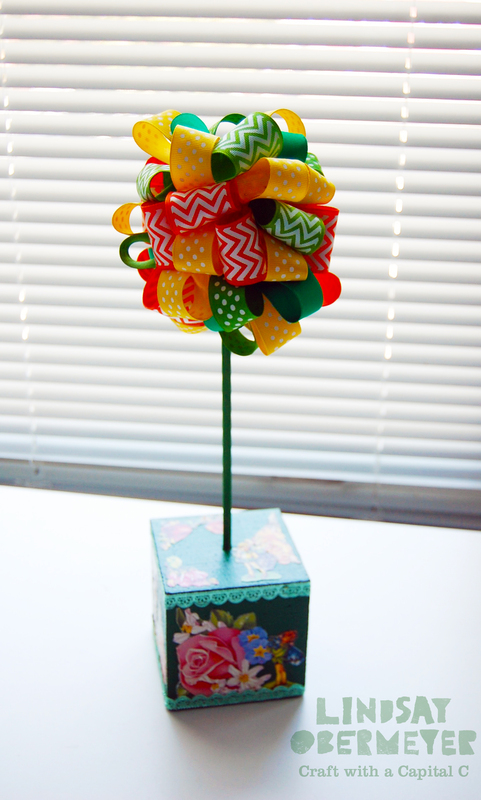 Use a hot glue gun to add flowers and a decorative hanger ribbons as desired – quick and easy! As summer comes to an end, I see the last of the flowers coming up. A friend of mine asked me for a kid-friendly flower project, so I thought using Smoothfoam to make this lollipop flower was the perfect idea! 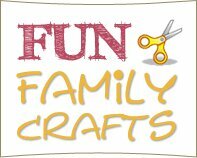 The kids LOVED it – it was fun and easy to make. Ages 3 and up can do this with help! I started by painting all of the Smoothfoam – the block is bronze, the rod is two blended shades of green, and the discs/balls are blended with red, orange and yellow. To make it more fun for the kids, I put two colors of paint in a plastic bag and just squished the 3/4″ balls around inside until coated. Set aside on a paper towel to dry. 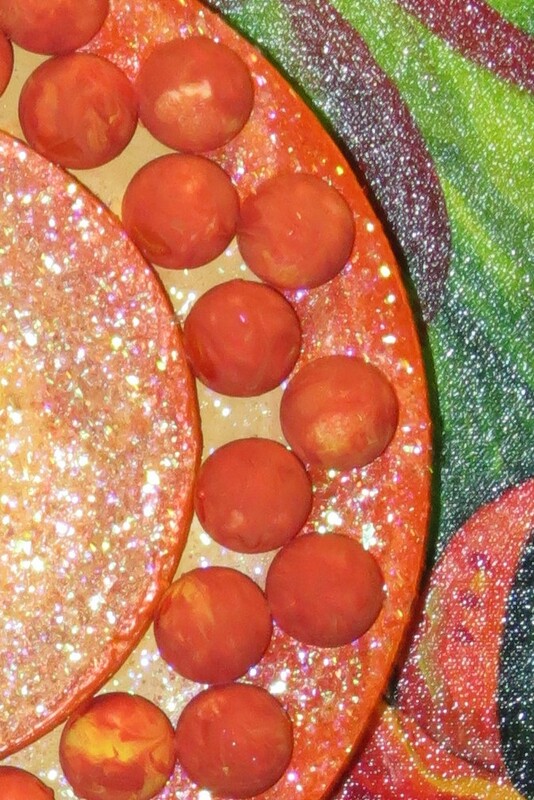 While the two discs are still damp with paint, sprinkle on the glitter. Once all is dry, layer and glue the two discs together. 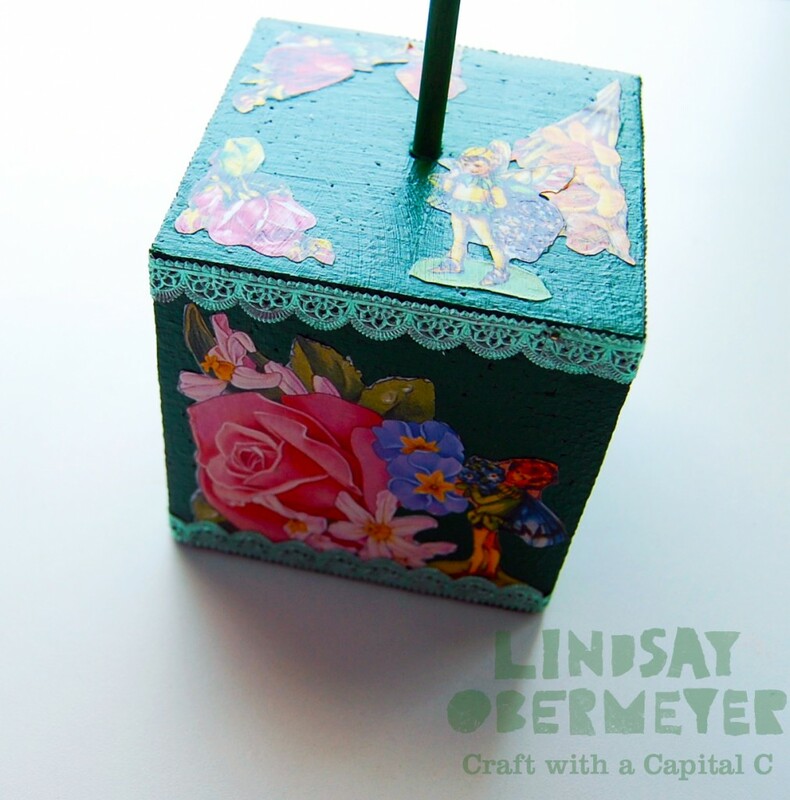 For the base and flower stem, glue the rod to block – for extra security, I used a long skewer to hold the two elements together, inserted from the bottom of the block. 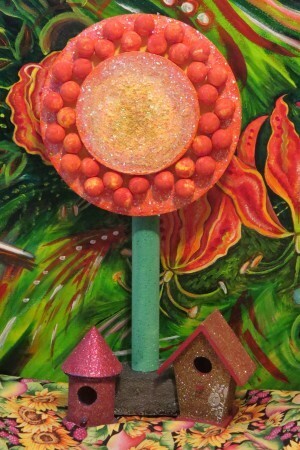 Use toothpicks and glue to attach the stem to the back of the flower. Glue a few metal washers or coins to the bottom of the block if needed to weight the flower so it stands straight and balanced. We are getting ready for a birthday party by decorating with lots and LOTS of giant crepe paper flowers – all for The Little Princess (aka my granddaughter). I will be making several different styles – here is the first one I made, using a Smoothfoam ball as the center. This large paper flower is 18″ in diameter and very sparkly! And now I only have about 74 more to go. Learn how to make these DIY flower decorations below. 1. 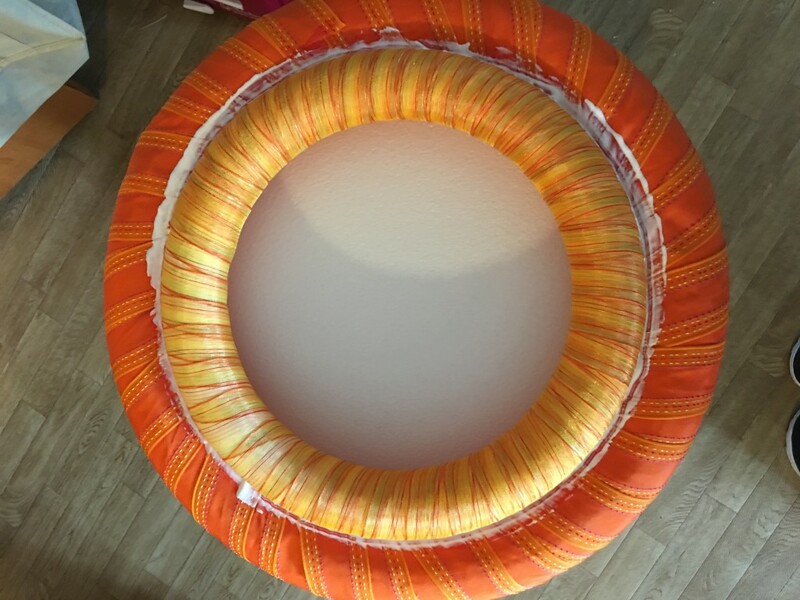 Remove one side of the paper liner and press the adhesive sheet to the chipboard circle and trim away the excess around the circle. Gently score the second paper liner on top into three concentric circles. Remove just the outer circle first, to expose a ring of sticky chipboard. 2. 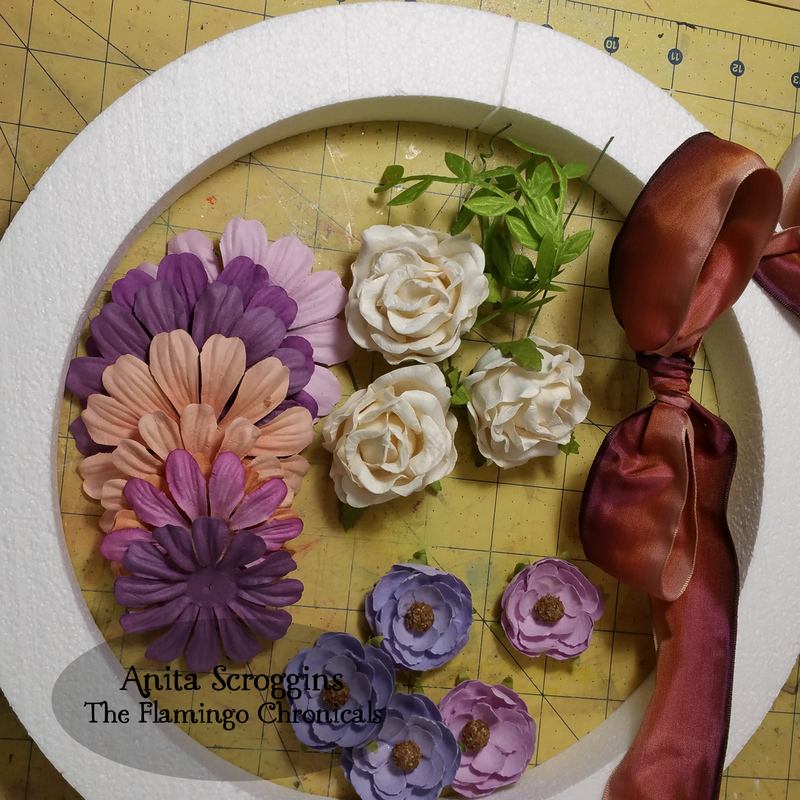 Cut ten 6″x10″ pieces of crepe paper for the outer layer of petals and trim out a curved edge as shown above. Gather each petal across the bottom, staple the gathers together to maintain the shape and press down to the sticky side of the chipboard. 3. Space the first five petals evenly around the circle, then add five more petals in between. 4. 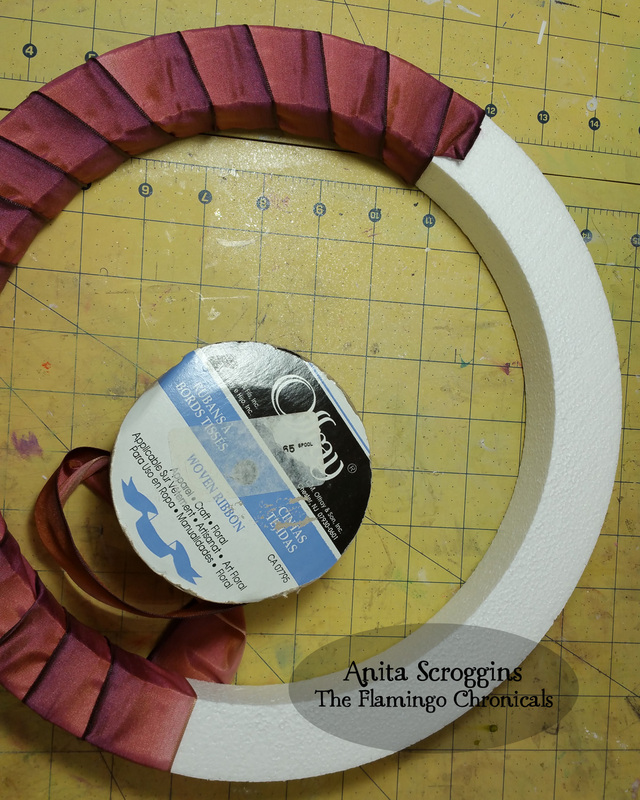 Remove the middle circle to expose the next ring of adhesive for the second layer of petals. Cut a few 5″ wide strips of crepe paper. 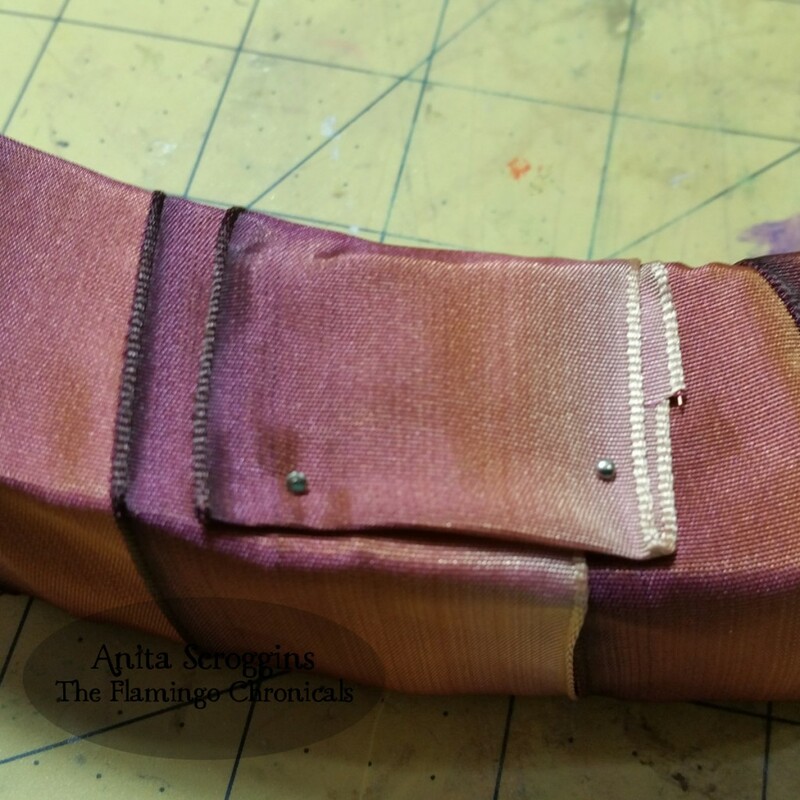 and gather the bottom edge as you press a strip down to the adhesive. Add a new strip at the end of the first strip until you’ve gone all the way around. 5. 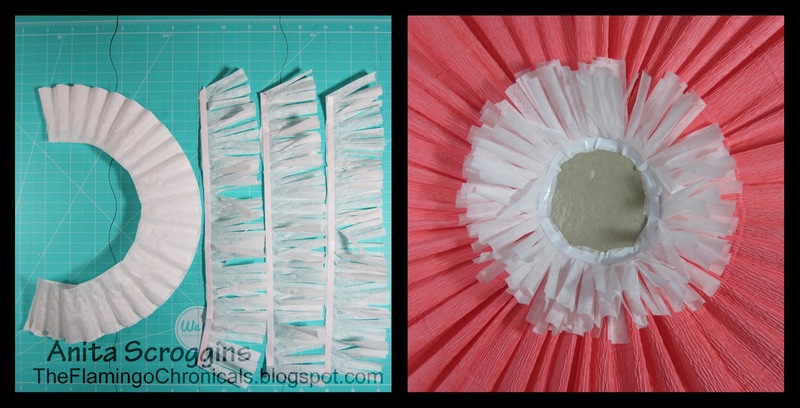 For the flower’s center, trim off the outer rings from 3 coffee filters and cut into the edges with scissors to fringe. 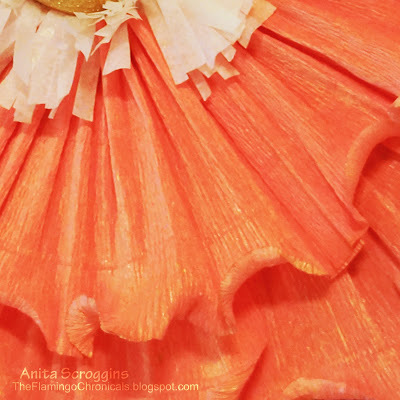 Remove the last bit of paper liner, then layer and press the three fringes together in the center of the flower, leaving about a 2.5″ circle of adhesive exposed. 6. Cut the 3″ Smoothfoam ball in half with the hot knife and paint one half gold. Cover the surface with glitter while the paint is still wet. 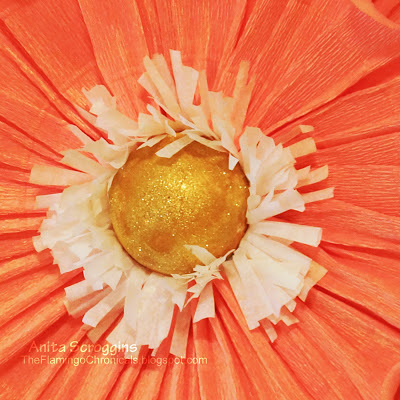 After it’s dry, shake off the excess glitter and add some craft glue to the back (for extra stability), then press it to the center of the flower. 7. Roll the edges of the petals using a chop stick, shaping as you go. Spritz the whole flower with gold metallic spray ink. 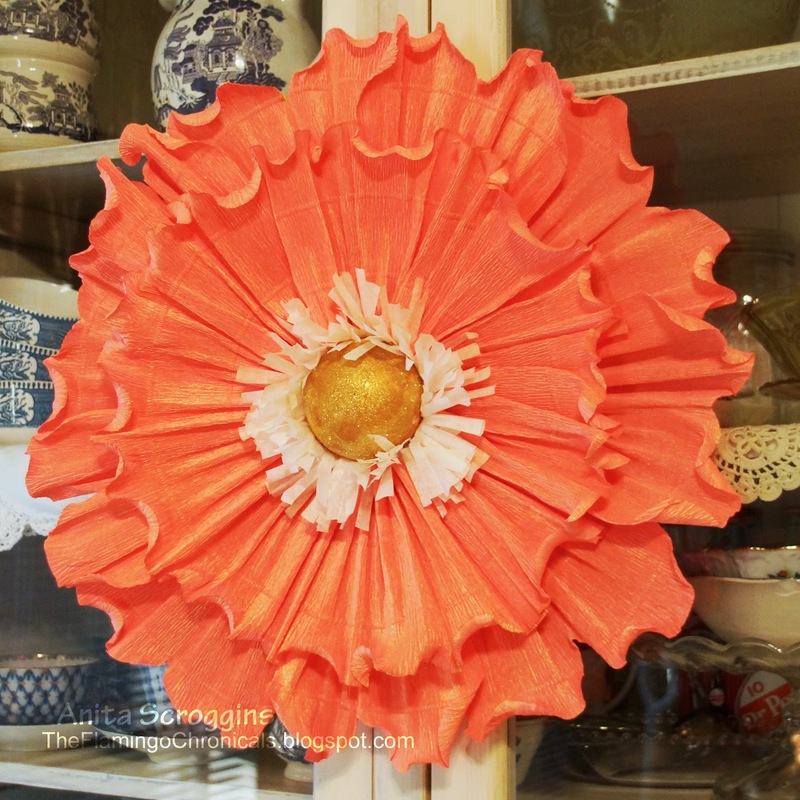 Glue a ribbon to the back for hanging your large crepe paper flowers. 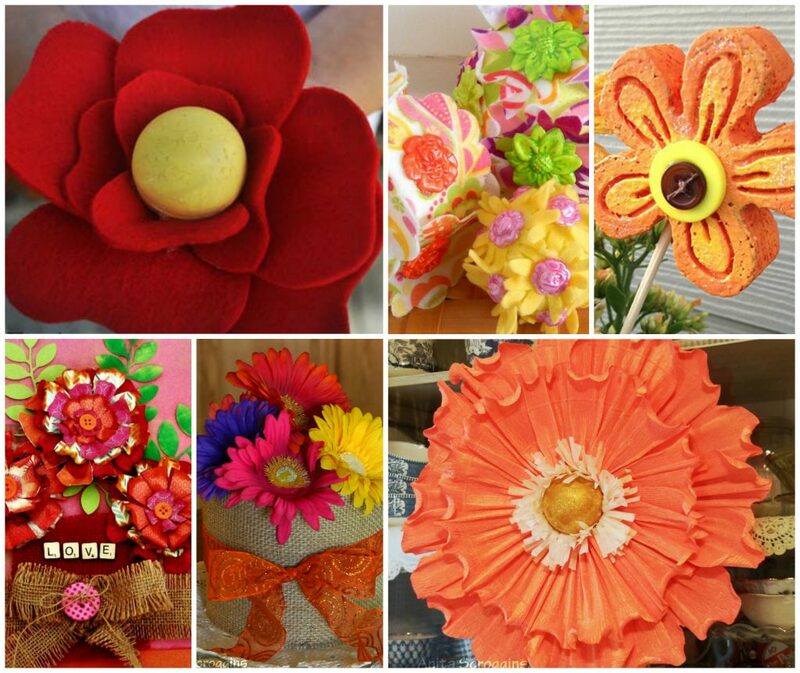 Find a variety of DIY flower decorations in our blog today!